Bring a bit of bold mid-century style and generous storage to the modern space with Nexera’s Liber-T 2-Door Bookcase. Crafted with care of eco-friendly materials offering a two-tone palette of rich walnut and white melamine that’s both eye-catching and easy to incorporate in all kinds of aesthetics, the Liber-T 2-Door Bookcase by Nexera allows you to show off some stuff on its open shelves, while stashing the rest behind two doors that can be arranged in the configuration that best suits your space. On its own, arranged in a set of two, or along with other Liber-T pieces by Nexera, the Liber-T 2-Door Bookcase is a crisply styled solution for contemporary organization in the home or at the office. Coordinates with other Liber-T pieces by Nexera. 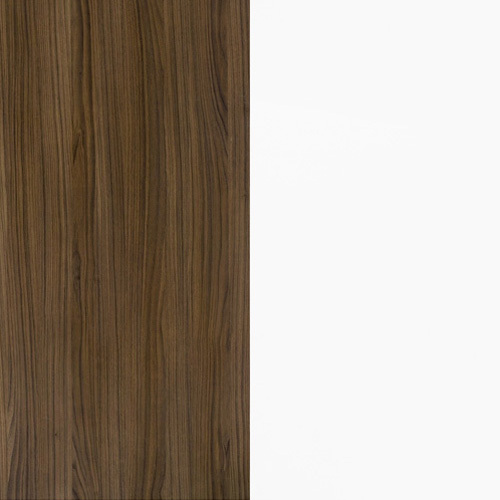 Eye-catching and easy-to-incorporate two-tone palette of white melamine and walnut laminate. two enclosed sections and two open compartments. Environmentally responsible construction of CARB/EPP/SCS/FSC certified particle board and MDF materials. What is this made out of? The Liber T 2-Door Bookcase is made out of CARB/EPP/SCS/FSC certified particle board and MDF material, white melamine and walnut veneer.